Nintendo seems to have been following a pattern with Dr. Mario in recent years. First, it releases a new title in the series for its current console which adds a new gameplay mechanic. Then, sometime later, it releases a new handheld entry, which plays it a bit more safe and doesn't really do anything new. 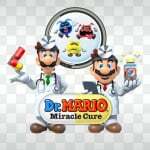 The latest game, Dr. Mario: Miracle Cure, surprisingly breaks this pattern, adding a big new gameplay element while also essentially being a combined port of Dr. Mario & Germ Buster (AKA Dr. Mario Online Rx) and Dr. Luigi. 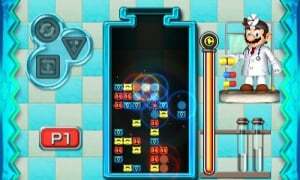 In case you've never played a Dr. Mario game before, the concept is quite similar to Tetris and other falling block puzzlers. You're presented with a screen dotted with a bunch of viruses, and Dr. Mario (or Dr. Luigi) will toss pills - each consisting of two segments - towards the top, which then slowly begin falling down. Your objective is to drop these on, next to or otherwise near these viruses in order to clear them out. Creating any horizontal or vertical line consisting of at least 4 pieces - of which at least one is a pill - will clear that line out and remove the viruses from the screen. However, if your screen fills up all the way to the top, it's game over. As mentioned, this is essentially a combination of two previously released games, featuring three different game modes. Naturally, the regular Dr. Mario is one of them, which features the standard, classic rules. 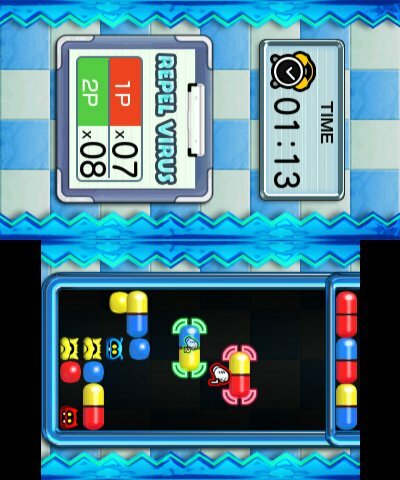 The other two are Germ Buster - also known as Virus Buster - from the WiiWare game, in which you hold the 3DS console in "book" orientation and use the touchscreen to drag and drop pills rather than moving them around with buttons, and Dr. Luigi, where pills are dropped two at a time in an L-shaped blister pack. These three modes are playable in four different ways. The Miracle Cure Laboratory presents you with some increasingly difficult preset scenarios and tasks you with clearing them, essentially acting as a way to learn how the game works. In the Custom Clinic, you can play any of the three modes freely, with Dr. Mario and Dr. Luigi being playable in the classic, level-based fashion, in an endless mode where new viruses keep being added until you lose, or against a CPU opponent. 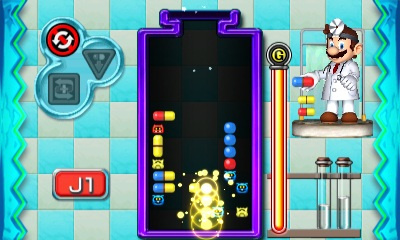 Germ Buster is only playable with levels. Just like the previous few games, you can also play against others, which makes up the remaining two main menu options - online and local multiplayer. Just like in the previous few games, online mode allows you to play Dr. Mario or Dr. Luigi against other players around the world, which works essentially the same as playing against a CPU. Stringing together combos and otherwise clearing viruses will send "garbage" pills towards your opponent's screen, usually falling in places where they don't want them, but occasionally helping them out. Online mode also has a leaderboard, so you can see how you stack up to others. Local multiplayer naturally works the same as online, just with a nearby friend, while Download Play is supported. Of course, we should mention the game's big new feature - the titular Miracle Cure. This is an option that can be turned on or off in Dr. Mario and Dr. Luigi modes, both offline and online, and essentially adds power-ups into the fray. With Miracle Cure enabled, once you clear enough viruses or pills to fill up a special meter, one of four power-ups will act as the next pill and can be dropped anywhere you want. These power-ups have various effects, such as allowing you to take out all objects in a horizontal or vertical line, blowing up everything in a diamond shape, or even clearing out all nearby pills or viruses with the same colour. These can influence the game in a pretty significant way, so they're quite fun to try out - especially in multiplayer matches. Curiously, one of the ever-present options has been disposed of this time around, as you are unable to select the music you want to listen to while playing. Instead, the game will randomly select a song every time. This isn't a deal-breaker by any means, but it's an odd omission considering the option has been around since the series started. The music itself seems to be taken directly from the last few entries, so unfortunately there aren't any notable new arrangements. Graphically, the game looks clean and simple, which is all you can really ask for with Dr. Mario - it's never been a graphical showcase. The console's 3D effect is present on menu screens, but is disabled when you're playing the main game. That's an incredibly odd use of 3D. Downloaded, just waiting for release. Not really interested. If you've played one modern Dr. Mario, you've played them all imo. Dr. Mario is just one of those games I could not get interested in. Nice, the multiplayer stuff seals the deal. I've heard this title has Download Play, too. I'm glad I held off on Dr. Luigi. Excited for this. Have had it prepurchased and predownloaded, awaiting release. I love Dr. Mario and am pretty intrigued by the new play modes. Its nice to see them throwing some extra stuff in so it's not just another rerelease of the same game with a fresh coat of paint. I won't be getting this. Just not my type of game. Huh, I actually kind of forgot about this. It's awesome that it turned out to be something nice and fresh, but I don't know if I'll get it myself. I'll get this game eventually but I want to save my eshop money for E3 to see if Nintendo releases any good surprises on the eshop. I wish they had like...some sort of unlockables. :/ I mean, what would I be playing it for? If I was playing SSB, I'd be getting gold for trophies, along with the possibility of getting other prizes sometimes. I really hoped SOMETHING like that could be included in this...not trophies, but even like...maybe music, art, or alternate costumes for Mario and Luigi? I really wish this had a retail release, even more so after this positive review. Other puzzle games still get them, why not Dr. Mario? Nintendo probably realizes that, as fun as the game is, there isn't much to it. A retail release would be $20 to $30 more. I'm honestly not sure it'd be worth it, if it doesn't have that much in the way of content. But it's a perfect fit as a low-priced download game. For local multiplayer, does each player need to have a copy of the game? Ugh, I want this but I'm saving my eShop money for Lucas. Maybe another time. This is a no brainer for me. I love Dr. Mario, and this looks like it pretty much wipes the floor with Dr. Mario Express in terms of the number of modes and features included. Can't wait to give it a go! I'm a huge tetris fan, but I have yet to play a Dr. Mario game. It always looked so much more strategic and less straight forward in comparison to Tetris. I'd that a really positive 8/10 score. Or, well, it is Nintendo and it does have Mario so we can stretch to an 8. I can't wait. This and Tetris are my fav puzzle games of all time. But I could care less for the news power ups. Is this worth picking up if we already have Dr. Luigi and WarioWare Inc. on 3DS with Dr. Wario unlocked? I guess for online/multiplayer? Dealmaker for me is online mp. Were the other Dr. Mario's popular online? Personaly I allways prefered GameBoy iteration of this game. The original colors always confused me while the GameBoy viruses and capsules are nice and clear to me. As I own the game, both for GB and for 3DS, I can't justify bying the same game again, especially if I find the colors confusing. Some modes seems to be interesting however. If you already have Dr. Luigi, the only reason to pick this one up is to play on the go. If you don't already have Dr. Luigi, this one is definitely worth it! Ranked online multiplayer is awesome! This is the definitive portable Dr. Mario. This is an essential game to have. In fact, it should have been released 4+ years ago when 3ds came out in USA! I might be getting this! I used to play the original, but this seems to have a lot of additional modes (haven't played Dr Luigi yet) and will be good to play during train rides to uni. Good to hear is has download play as well. This sounds like one of the best values a Dr. Mario game has ever offered, costing not much more than buying it as a NES VC (but with lots of new content and online play). Since I usually never buy Dr. Mario games, this one is getting my attention as a great value. Not day one, but I'm getting this soon. Sweet title, but it might have been nice to play the core game in 3D... on my 3DS. Been playing this since the Japanese release. It's great, certainly the best handheld Dr. Mario, but it still doesn't come close to Dr. Mario 64. When are they going to bring back four-player mode? Story mode? More characters? An art style that's actually charming? I just wish they would ditch this weird, sterile art style they've had for the past few games and put some personality back into it. Dr. Luigi was a step in the right direction, but this one kind of undoes that and puts Luigi on the backburner. I also wish they'd quit it with their tradition of adding features but taking some away. No song select or CPU level select? Really? I mean the new stuff is nice and all, and having the online mode portable is nice, but no song select, at least? I just don't understand. All I ask is an update to add back the option to change the music. Then and only then, this would be a masterpiece of Dr. Mario greatness. It's still awesome, don't misunderstand, but it would be the best of them all if it added it back. Bought it immediately. 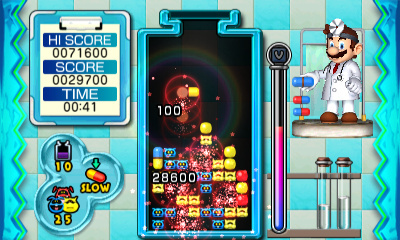 Best Dr Mario game ever, lots of modes and cheaper and more convenient than the Wii U version. The 3DS version is of course way better than the DSi version: many more modes, local and online multiplayer, more music and better graphics and resolution. @Shugo You can customize level and speed in Custom Clinic. Dr. Luigi has the same importance in the game as Dr. Mario and Germ Buster. You just choose whatever one you want to play. @Donutman You can disable the power-ups but they are a good addition for one player mode although kind of annoying (as usually) on multiplayer. Haven't gotten it yet. Wish it was 2D graphics like in the DSiWare version. That looked nicer. forgot about this until just now. Turning my 3DS on right now! @Donjwolf Seriously, i agree with you, Well I am not discouraging the game but what would be in 3D for a game like this. I downloaded it, played for a few hours, then I went ahead "F..ck it, let me try advanced, lvl 30" and I swear to you guys, I beat it first try! I beat the hardest level first try, but I am stuck with lvl 18 of standard mode, hah. I bought this for the nostalgia of playing Dr. Mario. I've played every Dr. Mario game made (except Dr. Luigi) and I was happy to see the inclusion of Virus Buster from the Wii version as well as the new miracle cures that add to the game. This game is worth the price and has online and local play that is very fun. For those worrying about the miracle cures, you can play with them on or off. I do wonder who is buying all these Dr. Mario games. Not having in-game 3D is kind of a big deal for a 3DS game, I'm surprised that it only got a brief mention at the end.